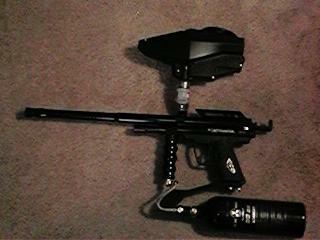 I started out my custom paintball marker with a PMI Piranha STS Core. My modifications include a psychoballistics drop forward cradle & psychoballistics X core 8 stage expansion chamber. Also added were a PMI venturi bolt, Dye X-cel 14" barrel, Dye black sticky grips and a Richochet 2K electronic loader. I have a 20 oz. and 12 oz. Pure Energy CO2 tanks to power the gun.